As some of you already know, I just returned from a two week trip to Japan. I flew into Tokyo, made my way over to Osaka for a week via the Shinkansen bullet train, stayed for a week, and then went back to Tokyo for a little over a week. 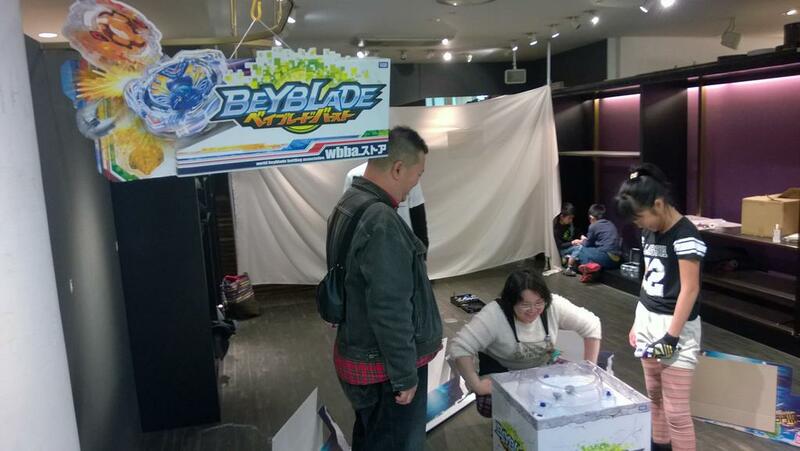 It's a trip I've dreamed of making for as long as I can remember now, and among many other things, I was excited to have the opportunity to go not long after a new Beyblade series had launched in Japan! Over the years, I've always wondered why the international community seemed so distant from the one in Japan, the birthplace of Beyblade. The basic answer to this question is obvious: the language barrier. And really, that is where the issue begins and ends. Largely, that is. But I've always thought that if we made the effort to connect and reach out to them, something would be possible. 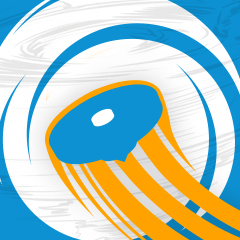 I think back to the days of Beyblade Damashii–a popular Beyblade fansite that was live around the same time as Off the Chain, the predecessor to Beywiki/WBO–which was run by Beholder, a Japanese father who was playing the game because of his son, from what I understand. 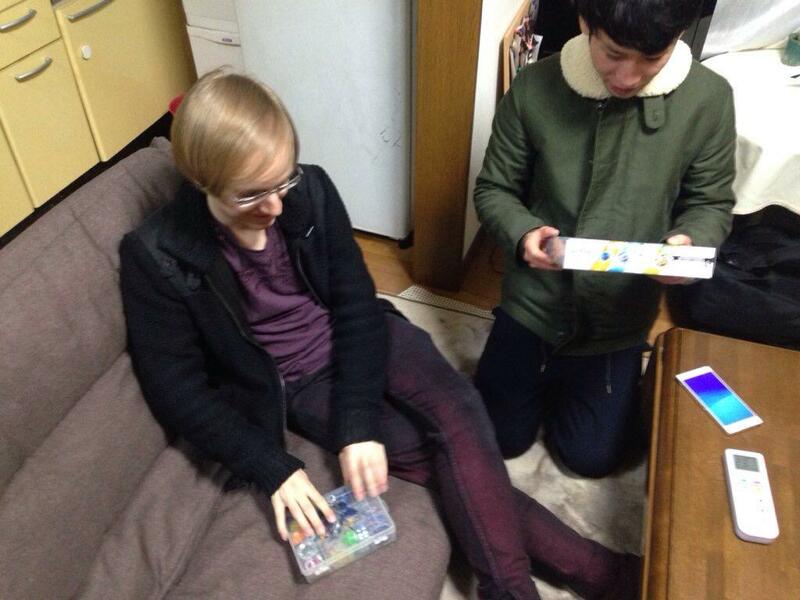 I think about Bey Brad's relationship with the Japanese Beyblade community not only now via his Twitter account, but also years ago through the Japanese BBS, BEYBLADE RENAISSANCE. And of course, I think about our current and past members on the WBO who live in Japan, like beybladejapan, OkiBlaze, OkinawamTS, and gankoba. 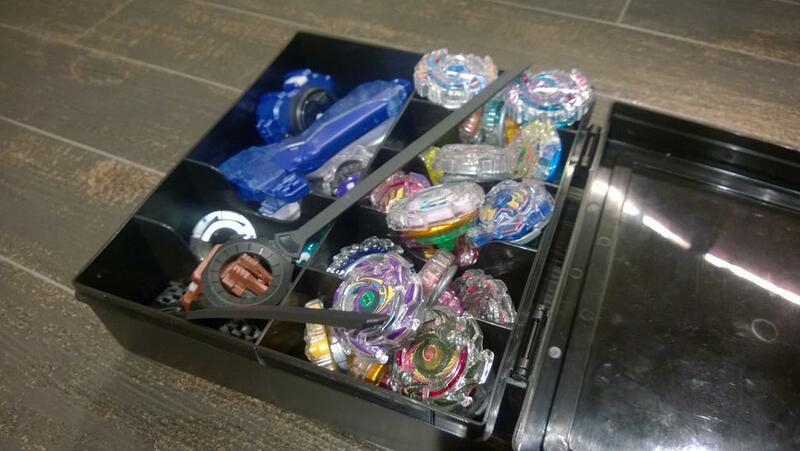 We call ourselves the "World Beyblade Organization", yet there's always been this huge missing piece of the puzzle hanging over our shoulders. After this trip, I've now begun to think that maybe we can make something happen. Given how literally far away Japan is from Canada, and how fragmented our two communities are, naturally, my curiosity towards learning about them and experiencing their events first hand was of great interest to me. Over the two weeks, I ended up attending a total of 5 events spread across Osaka and Tokyo. I left for Japan on November 20th. My flight was mysteriously delayed by four hours, which resulted in me arriving in Tokyo after the last Shinkansen had run for the day. I had to wait at Shinagawa Station for eight hours for the first train the next stay to arrive and take me to Osaka. Finally, I arrived in Osaka on November 22nd. But I had no time to feel tired or jetlagged; that night I planned to attend a concert, but a few hours after I arrived I was scheduled to meet OkinawamTS for my first event! After settling in at my first accommodation, I slept for maybe 30 minutes and then headed over to Nippombashi Station to meet Oki. 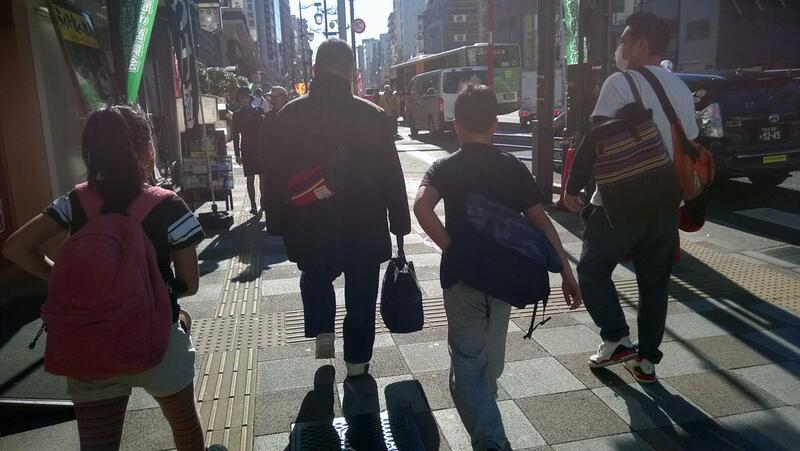 We met on the corner of the street outside the station and headed towards Joshin for the tournament. When we arrived not long after there was already a decently sized group of kids hanging out around the Beyblade display within the store. I picked up a few B-20, B-21, and B-22 and Oki also filled me in on the daily BP you could get from BeyPads at hobby stores around Japan while we were waiting. 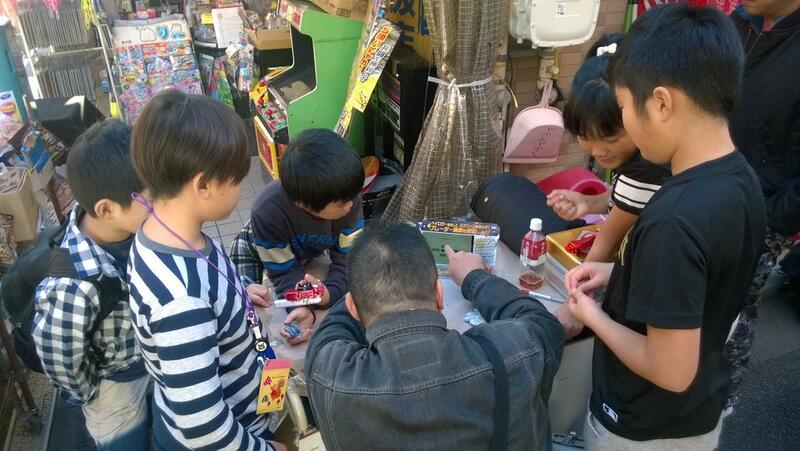 Many of the tournaments in Japan right now accept adults, but most of the time they give priority to elementary school kids when determining who can play. Thankfully, despite the relatively large turnout of around 20 people (which was the limit), there was enough space for Oki, myself, and several other older adults and kids to play. The format for this event was a little odd. Essentially, it was based on win-streaks. Within a 20 or 30 minute period, the Blader who could amass the longest win streak of single round victories over his or her opponents would win the tournament. I watched the first several rounds go by before my turn to play came up. I'm recalling all of this from memory, but what I can say is that Deathscyther is definitely still the king of Stamina in Japan. I was surprised by not only this given Odin's recent dominance elsewhere in the world, but by the fact that a couple of the best players were using not Deathscyther Spread Survive, but Deathscyther Heavy Defense! I was puzzled, but figured I would have it easy with Odin Heavy Defense. I was right. I ended up winning ten or more battles in a row to eventually take 1st Place at the event. But I didn't win indefinitely. What stopped me? Deathscyther (Heavy Defense? I can't recall for sure). I had beaten a couple Deathscyther's during my win streak, but a kid was eventually able to beat me somehow with it! Odd ... More on this when I get to explaining the other tournaments. However, I should mention that I did use Wyvern Heavy Claw for one battle. I noticed that one woman was using Valkyie ? Survive and feared being Burst Finished even with Odin Heavy Defense, so I switched. Throughout the event I also noticed several Wyverns in use, for what it’s worth. Many players did not use terribly competitive combos from what I can remember, though. 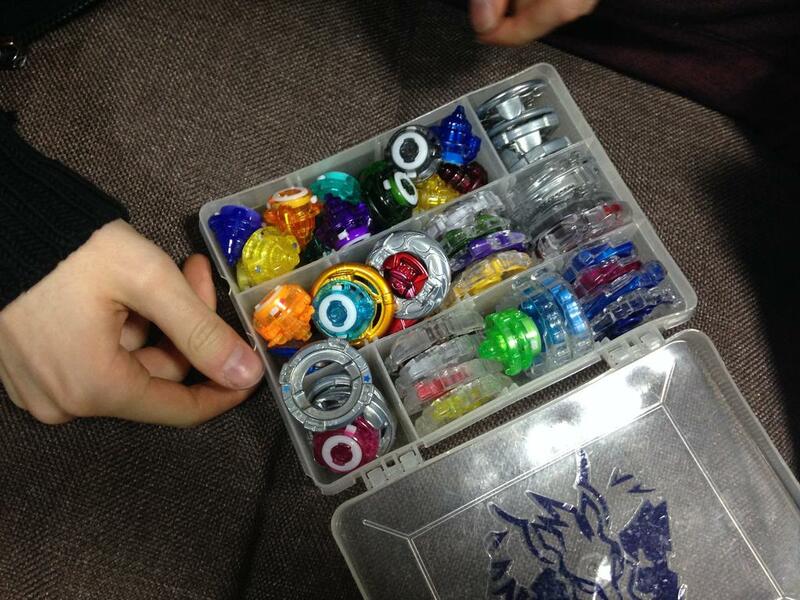 There was little, if any Attack types–or even Beyblades using somewhat aggressive Drivers, for that matter–in use. Unluckily, very early on in my win streak, I had to play Oki, but was fortunately able to beat him. 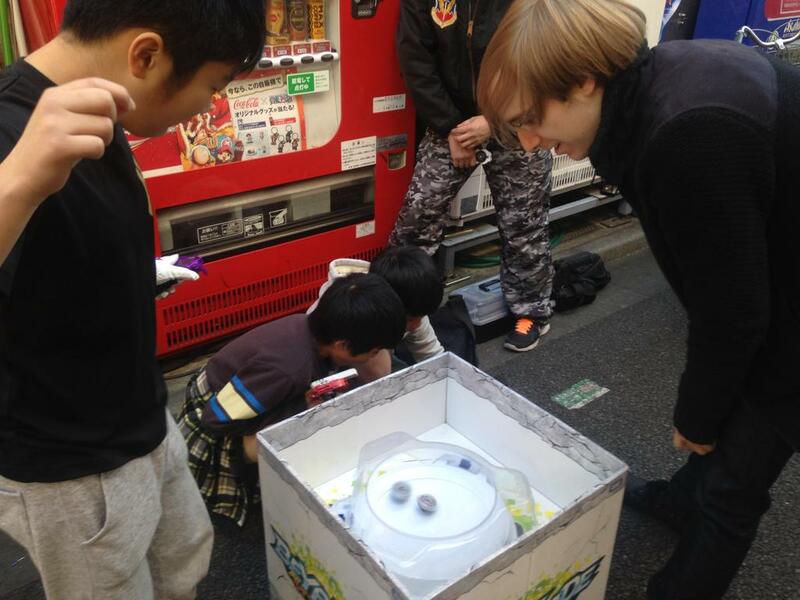 Also during my win streak I had the honour of playing against ベイマサ (Bey Masa), who is currently ranked ninth in all of Japan for total times shot, and is maybe the coolest Beyblader I've ever met. He must be in his late-50s or 60s. 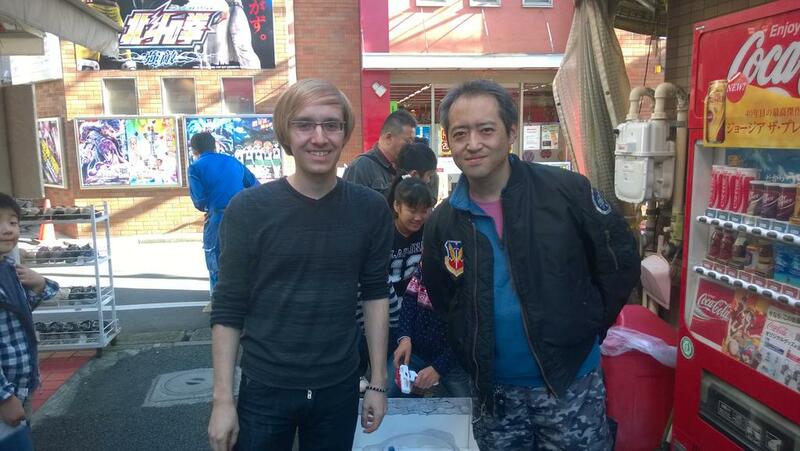 I had intended to go to a tournament in Kyoto as well the next day that he told me he was going to attend, but unfortuantely I got lost and couldn't make it (although I heard from Oki that it ended up being full). He was one of the few (or maybe only?) people who I saw using Odin Heavy Defense while in Japan. One of the best moments in this event was late in my win streak, looking up at the crowd and seeing the expressions of awe on everyone's faces. Especially some of the kids. Priceless. My next event wasn't until a week later in Tokyo. But between this, I moved to a guest house in Osaka after a couple days. 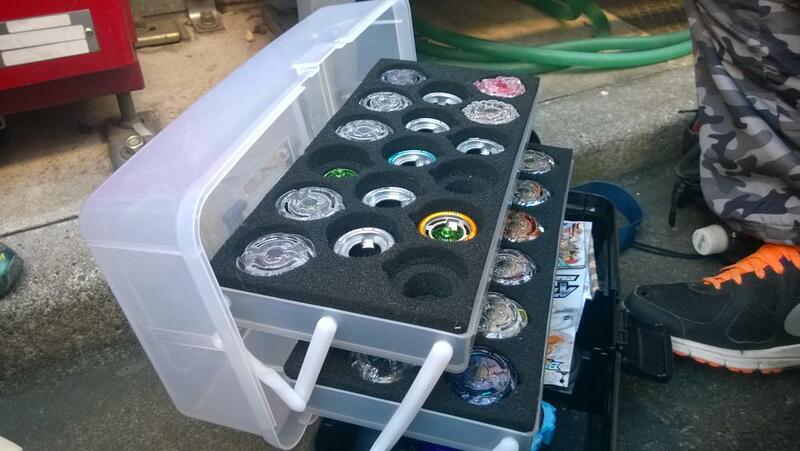 I mention this because of the hugely positive reaction I received upon showing the Beyblades I had bought and brought to my two hosts. At this point, so many people have such a great nostalgia for the game that this sort of reaction is somewhat expected, but it made me think about how widely appealing this game truly is. Opponents: Deathscyther Heavy Defense emerged as the go-to combination for the best players, some people used it on Survive, Odin Heavy Defense saw use but infrequently, Valkyrie ? Survive was used to some degree or success by one woman, several kids used Wyvern-based Stamina combos. 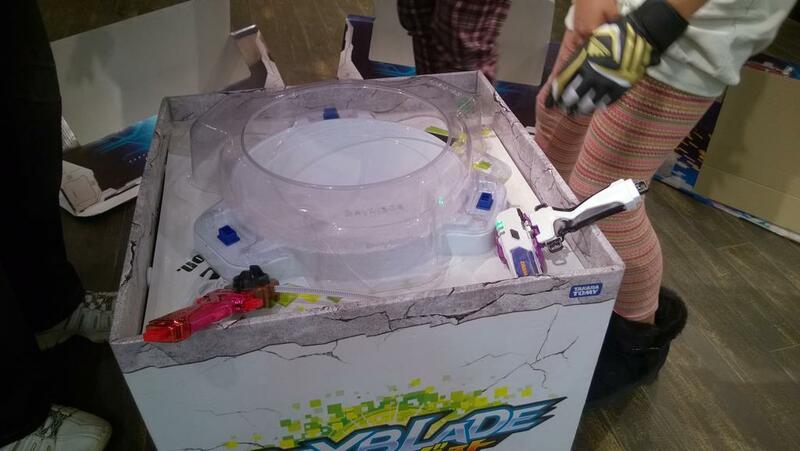 Very little–if any–mobile Beyblades using Accel, Blow, etc. Myself: Ran into very little resistance using Odin Heavy Defense; won 9/11 battles with it. Switched to Wyvern Heavy Claw against Valkyrie ? Survive. 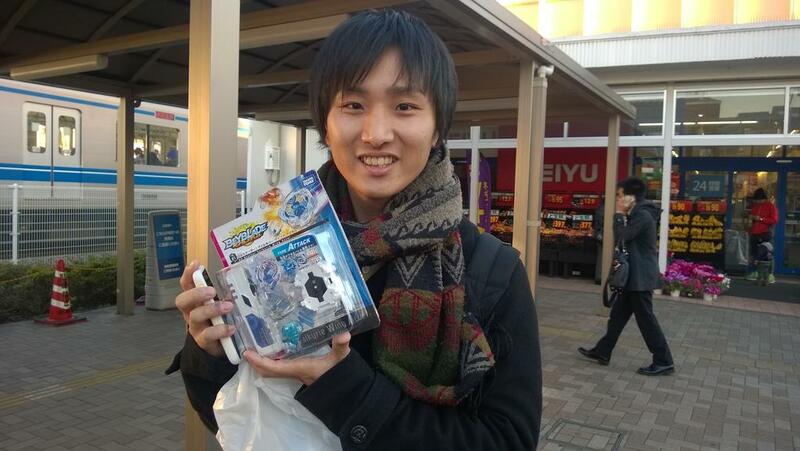 After much sadness having not won a single Amaterios Aero Assault despite over 30 tries on the RARE BEY GET BATTLE, "Handsome Boy" Yuuya miraculously won it for me on his first try! What you don't see in that video, but which Yuuya alludes to is the fact that not long prior to winning, I tried playing the game on his phone, but while it was loading he pressed the volume buttons and it somehow ended up draining my 3,000 BP and canceling the game before it even started ... So, beware of this lol. But from this point on, Yuuya became the “Tokyo Miracle Boy”. Even though this was amazing enough, what ensued in the following week was even more amazing, and frankly quite touching on so many different occasions. After the overwhelmingly positive and nostalgia-filled reaction to my Beyblade collection that previous night, Yuuya decided to accompany me to this event at Bunbuku Toys on a sunny Saturday afternoon. There was somewhere between 10-15 participants at this event. It is here where I would meet some of the strongest, most insightful, and kindest Bladers during my entire trip: members of WARI-BEY (わりべい) . What is WARI-BEY? 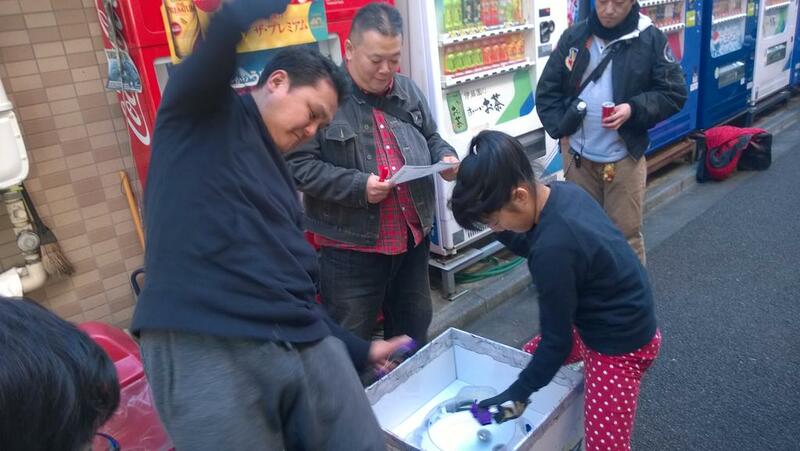 WARI-BEY is a famous Japanese Beyblading Team that has been active since 2002. Their members have been champions at all levels of Beyblade play, with two of the most recent examples being the Asia Championships in 2011, to the World Championships in 2012. With the great, unexpected help of Yuuya translating for me, I was able to sustain some level of conversation with them and learned several interesting things as a result. From what I understand, WARI-BEY is comprised of around 30 or 40 members currently that can be divided into several literal families of fathers/mothers and sons/daughters, and so on. As a result of this intentionally limited team size, becoming a member of WARI-BEY is something a lot of Japanese Bladers strive to or would like to achieve. The requirements for being able to join WARI-BEY are a bit nebulous for me unfortunately, but you do need to be passionate about Beyblade in a huge way. Look at that BBA World Championships 2004 sticker! Hardly unexpectedly, I eventually learned that coming into this event, RICK had won three consecutive tournaments. Throughout the event he was seemingly unstoppable with Deathscyther Heavy Defense; with it being apparently the best Stamina combo in Japan, the only way to beat it somewhat reliably other than hoping that you are stronger than your opponent is to use Attack. But because these type of players do not seem to exist–and when they do, they do not have the greatest shooting technique–RICK had a clear path to the finals and eventually took the tournament for his fourth consecutive win. I imagined that he had won many of his tournaments this way. 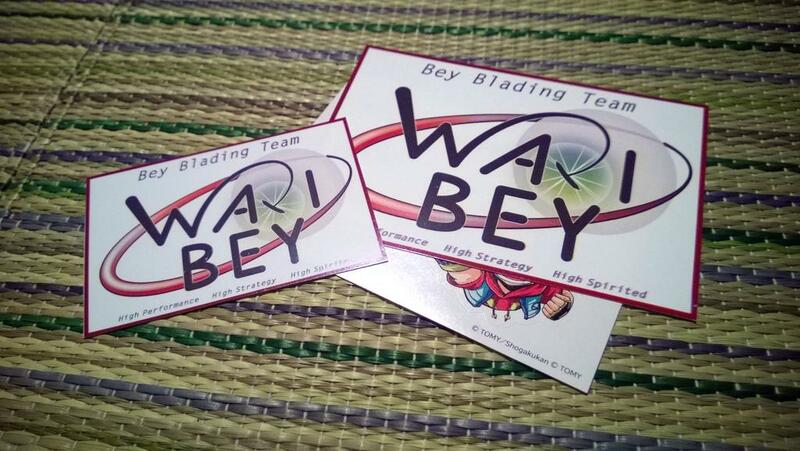 Jumbo was kind enough to give me these two WARI-BEY stickers. Apparently only members can usually obtain them, so they are quite rare! The format for this tournament was single elimination, but this was my first time playing under the more commonly known TAKARA-TOMY rules where an Over Finish (KO) or Spin Finish earns you 1 Point, and a Burst Finish earns you 2 Points, with the goal being 3 Points for victory. I asked everyone why Attack seemed to be so rare despite the (albeit, arguable) incentive to use it due to the 2 Points for a Burst Finish, and the answer was what you’d expect: it’s too risky. That said, after seeing the state of Attack types in Japan first hand, I do think it would have made more sense to push them even further by giving Over Finishes 2 Points as well (they are probably even harder to achieve than a Burst Finish). I’m pretty sure that’s how it was in the Metal Fight Beyblade era. Yuuya also played in the event … but didn’t do so well. Let’s just say he had some trouble launching! However, his presence was absolutely invaluable for me. Not only for taking photos, but without him translating for me, I would not have been able to communicate with everyone in any truly meaningful way. Thank you so much Yuuya! After the event, as thanks for helping me win Amaterios and coming to the tournament with me, I bought a Valkyrie DX Starter for him. 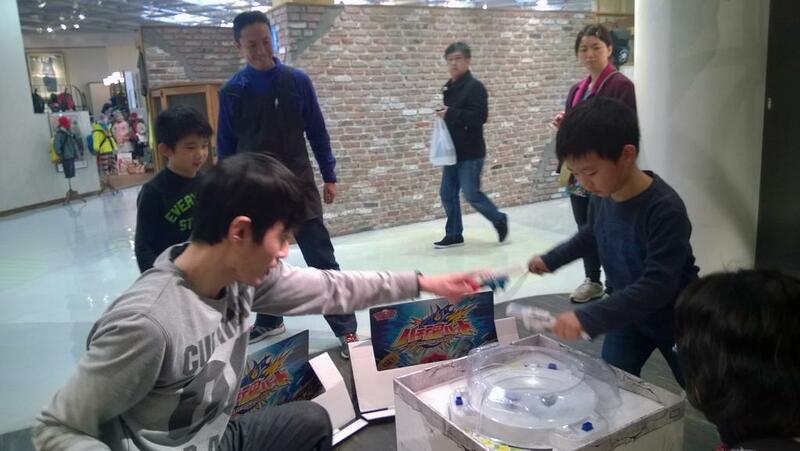 :) His first Beyblade in a long time. Opponents: Deathscyther Heavy Defense won the tournament for RICK and was also used by MIYU and other players. Interestingly, Jumbo used Deathscyther Heavy Massive and had some success. This tournament went by quickly, so I can’t recall much else. I can’t end this section without showing Jumbo’s custom made Xtreme Drivers. Don’t ask me how he made them because I have no idea. 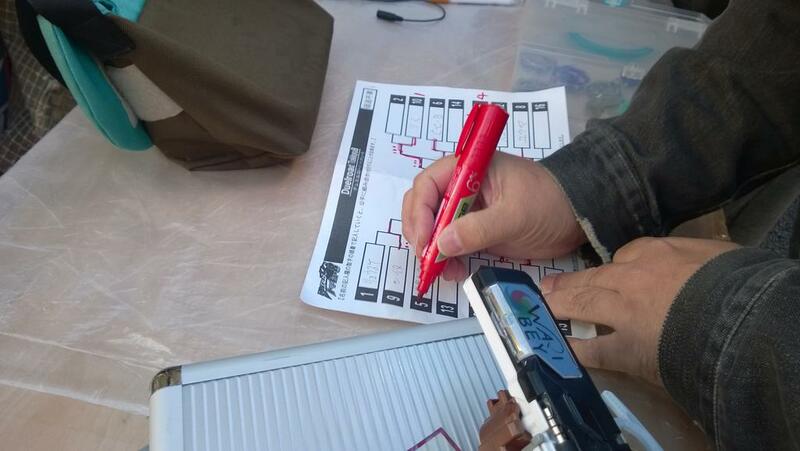 This tournament again was single elimination using the regular TAKARA-TOMY rules (1 Point for Over/Spin Finish, 2 Points for Burst Finish, 3 needed to win the battle). I won the first round, lost the second, and then in the third I believe was Burst Finished, ending the battle at 3-1 … It was odd to me at this point that Odin seemed to be bursting more often than Deathscyther, despite Deathscyther’s notoriety for being prone to bursting, especially with Heavy. I didn’t get a chance to ask Jumbo why he uses Massive, but in any case, maybe it is something worth looking at! 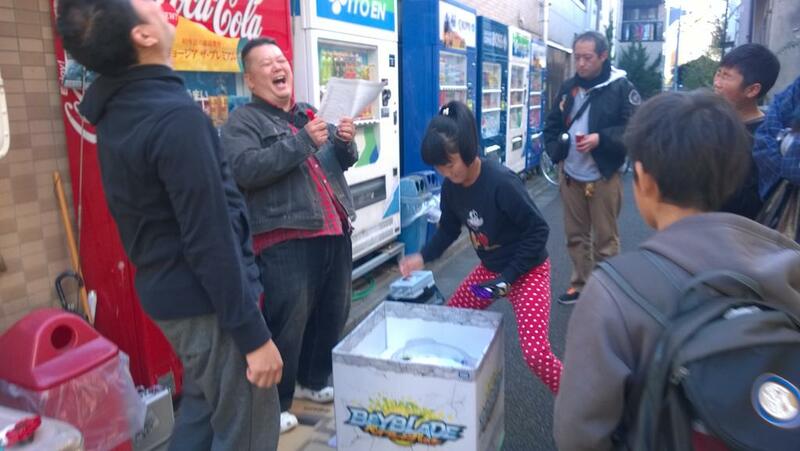 After this I was put into the battle for third place against a Blader named がんじちゅう. 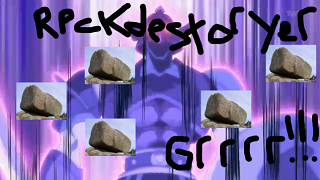 Surprisingly, he was actually using an Attack type. After observing his first battle I wasn’t sure he would necessarily pose a huge threat, especially with his use of Oval, so I opted for the fairly safe Wyvern Heavy Claw and won the battle, earning myself a black wbba. Fusion Driver (which I then proceeded to lose on the plane home …)! I think somewhat jokingly, Jumbo decided to use Minoboros for the final against RICK haha. RICK ended up winning, but Jumbo made it interesting with a Burst Finish in one round! 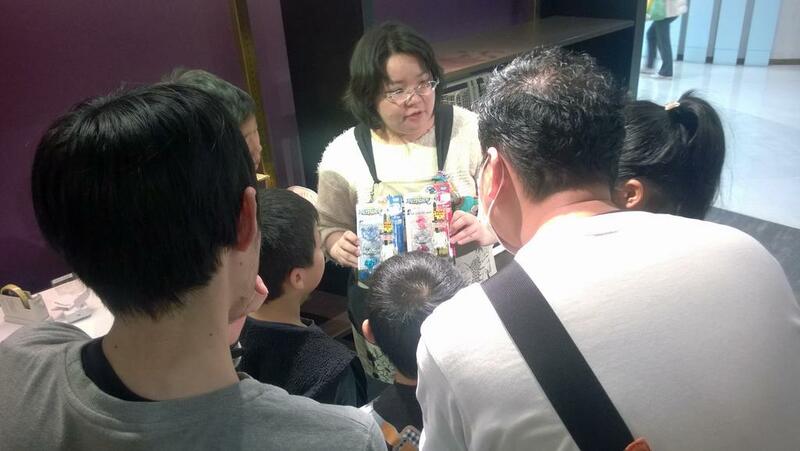 It was also the day the Valkyrie and Spriggan Entry Package sets were released, so before the tournament, one of the shop employees was showing them to everyone. 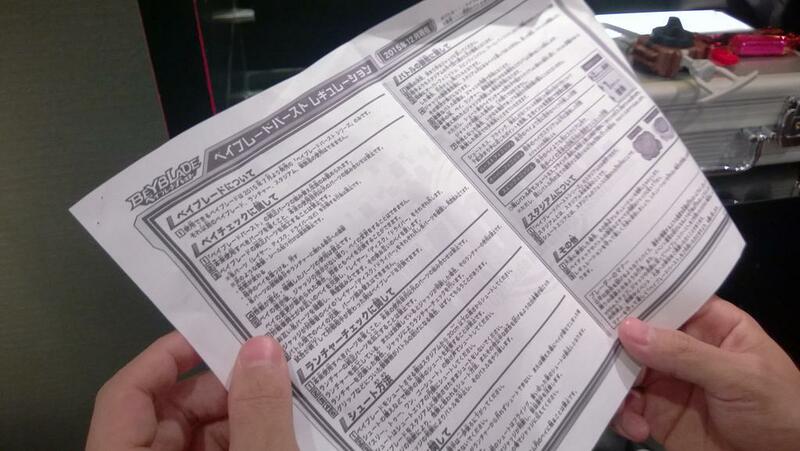 She also showed us the shop catalogue for all of the upcoming releases (Excalibur Force Xtreme, RBV2, the the black BeyStadium, Neptune Armed Zephyr, Angle Grip, etc.)! 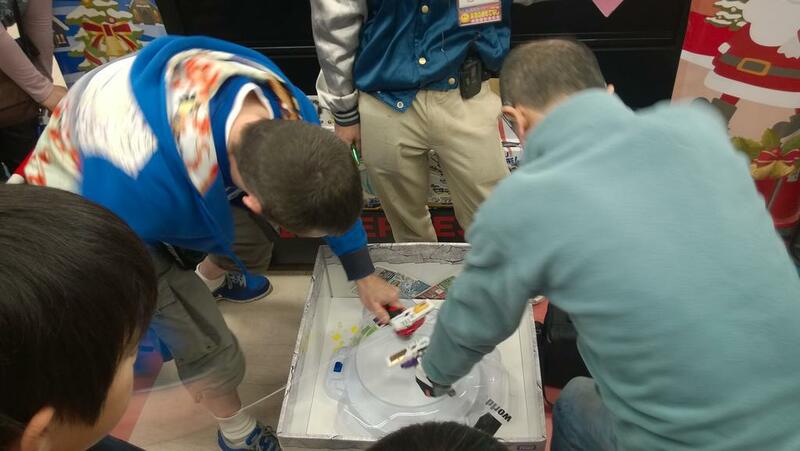 After this event, Jumbo told Yuuya and I that they were rushing over to another tournament that was due to start very soon at Bunbuku Toys, the same store I had played at the previous week. So of course, we followed them! 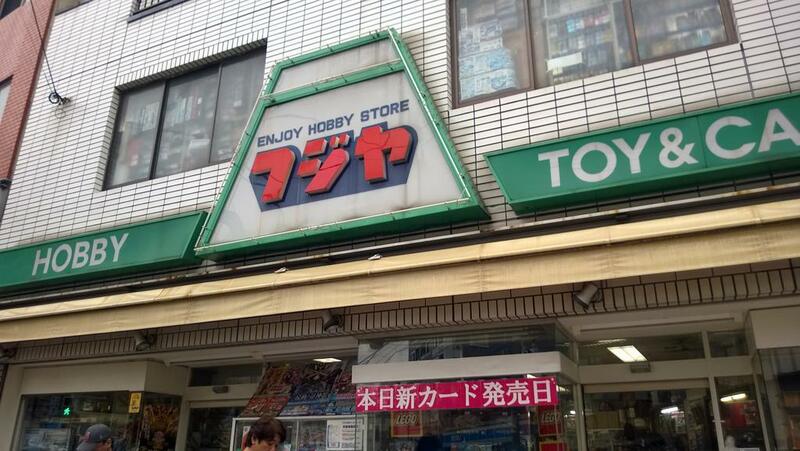 After maneuvering our way through the streets of Tokyo and the subway, we arrived at Bunbuku Toys. Thankfully Jumbo had called ahead of time to let the shop owner know we were coming; he was kind enough to wait for us even though we were a bit late. There was again 10-15 participants for this event. Amazingly (for everyone but them), Jumbo・わりベイ and RICK・わりベイ were paired up against each other in the first round: Jumbo again used Deathscyther Heavy(?) Massive, but RICK took the battle with Deathscyther Heavy Defense. Then, even more amazingly, MIYU・わりベイ and RICK・わりベイ ended up being put up against each other in the next round. It goes without saying that it was a Deathscyther Heavy Defense mirror match. MIYU ended up taking the battle narrowly due to a Burst Finish, ending RICK’s winning streak at four consecutive tournaments! I was disappointed knowing I wouldn’t have a chance to play RICK in a tournament battle, but happy to know I had a chance to exact some revenge on MIYU hahaha. If I remember correctly, I used Odin Heavy Defense to win my first two rounds, eventually earning myself a spot in the semi-finals against MIYU. She used Deathscyther Heavy Defense, but this time instead of using Odin Heavy Defense, I opted to go for the mirror match and chose Deathscyther Heavy Defense. This ended up being the right choice and I was able to win the close battle! One interesting thing Jumbo mentioned was that the red Deathscyther is apparently more prone to bursting? I had mine on me and decided to use it since it was brand new. Not sure if his claims are true or not. The reaction at the end was incredible; I wish the video had continued on for another ten seconds! 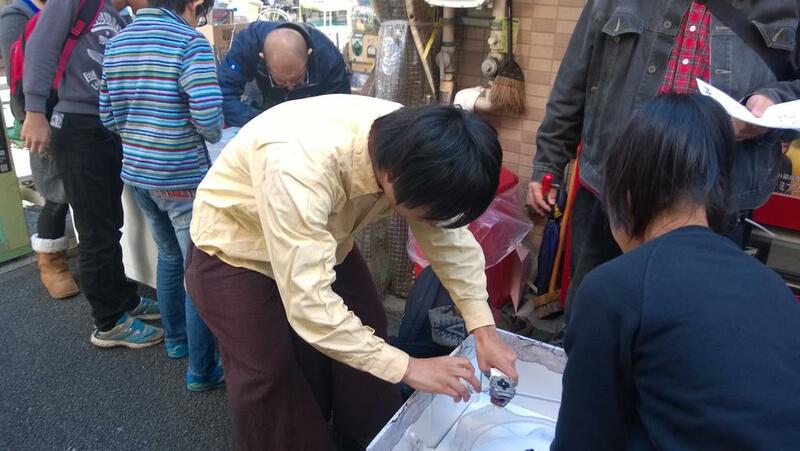 In particular, I have to talk about Ruka (るか), a young Blader I met at this event. 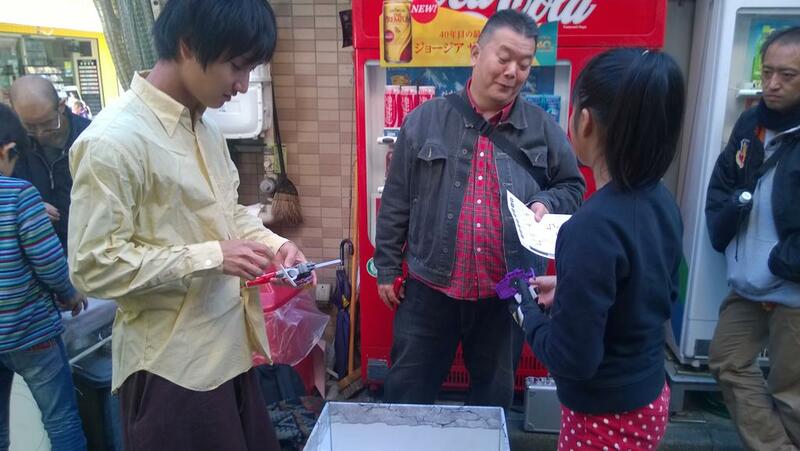 For some reason, he took a liking to me and after seeing me play called me ”equal to god” according to Yuuya. Of course, when he asked for my autograph, I obliged. Next up was the finals. At this point, I had intended on this being my final tournament of the trip. As a result, I decided to take a certain level of risk and went for the deadly, but almost-never-seen-in-Japan Valkyrie Heavy Accel to go up against ブレーダーMASA’s Deathscyther Heavy Defense. It felt right to go for it. I was surprised to see that he was using Deathscyther because at the previous event we had freeplayed after the tournament and I was using Valkyrie with some success against his Kerbeus Defense combo and a few other things. Deathscyther Heavy Defense isn’t necessarily the worst choice, but I would have expected him to go for something using Wyvern for the added Defense. But given the conservative nature of competitive Japanese players (generally speaking, of course), going for a more pure Defense combo must seem like just as much of a risk as going for Attack does. Final score was 4-1, along with one shot miss on my part. That last second KO to win me the tournament was so unexpected! For me, it’s battles like this that exemplify why Beyblade Burst is so fun; not only are short battles exciting as you would expect, but long ones can be as well since it is possible for them to end in a more viscerally exciting way through a Burst Finish. In previous generations late-game KOs were possible, but I feel like in Beyblade Burst there is a renewed sense that when using an Attack type, you have a realistic opportunity to win not only at the beginning, but the end as well if you were able to land strong hits early on. During the final battle, Yuuya told me that Jumbo was praising my launch technique. He said that very few players can shoot like I do and it’s quite rare to see. I was flattered, but wondered what he would think if he could see WBO Bladers first hand! After the finals, I started free-playing and noticed I had become quite popular all of a sudden … Hahaha. 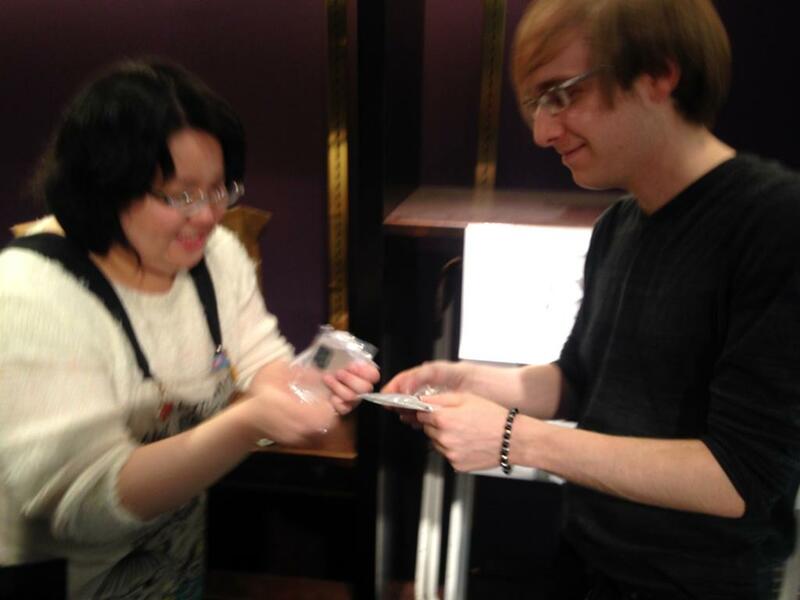 Ruka continually hugged me, shook my hand, and thanked me. It was cute. Everyone seemingly wanted to play with me! :) I must have played like 20 or 30 battles consecutively in the Standard and Burst Type Stadiums. Was happy to get a chance to play with RICK, even if it was just for fun. December 6th was my last day in Japan. I left that night at 6:50PM, which meant I had enough time for one final tournament. ブレーダーMASA had mentioned to me the previous day before we parted ways that there was an event at a place called Fujiya. After calculating whether I had enough time to make it over there and back to safely catch my flight, I decided to go. 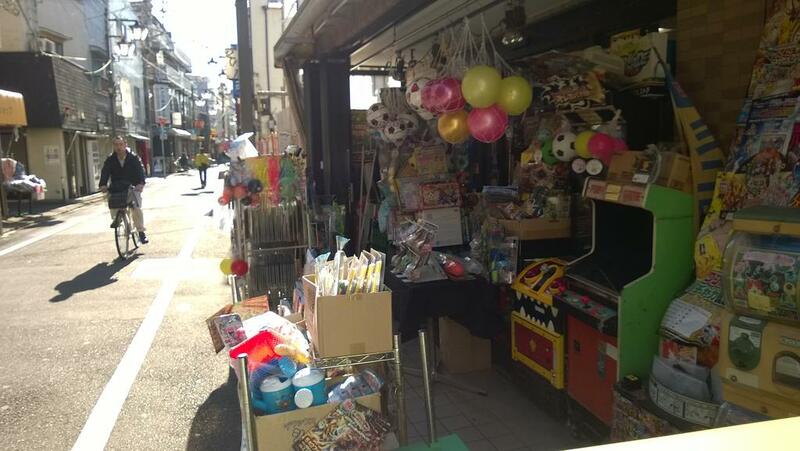 Unfortunately this shop had a policy of no photography, so I have no pictures from the actual event. But because this was the last event I attended, it is the clearest one in my memory so hopefully this re-telling is interesting enough to read. On my way to Fujiya, ブレーダーMASA and I bumped into each other at the subway station near the store and walked over there together. Upon arriving we went up to the second floor where the tournament was to take place. ブレーダーMASA introduced me to keep・わりベイ, Rank 27. He is a member of WARI-BEY as well and apparently, his son was the winner of the Asia Championship in 2011! He happened to have a photo album on him filled with great personal photos from this event; I wish you all could have seen it! 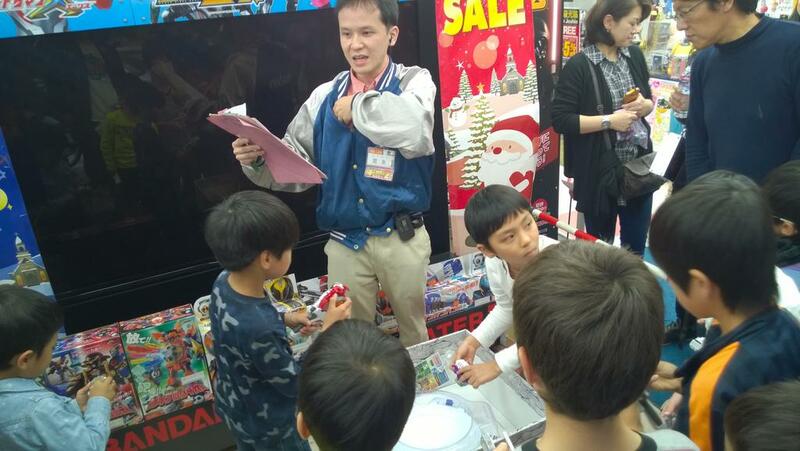 After registration eventually ended and all 15 players had been accounted for, the shop employee started to explain the rules for the event. The format was essentially Swiss, which I was very surprised by given my experience at the previous four events in Japan. As a result, this tournament felt the closest to what I have become accustomed to on the WBO over the years. We were to play four rounds of Swiss, but rather than determining the winner of the event based on battle wins, it would be based on points cumulatively scored throughout the event. Most interestingly, what this means that while it only takes 3 Points to win a battle, you have an opportunity to earn up to 4 Points in any given battle with the ability to score 2 Points for a Burst Finish. Unfortunately, this small detail is something I didn’t catch until a few rounds of Swiss had passed. You’ll see how everything played out, but had I realized this from the beginning, it may have changed my approach to the event because under these rules it becomes hugely advantageous to take the risk to use an Attack type because you have an opportunity to gain “extra” points more frequently. It’s important to remember however that while gaining points is important, it is also important to stop your opponent from gaining points, because there is a chance that the 2 Points you gave up to them in an earlier round could be what puts them ahead of or in a tie with you later on. In some ways, it reminds me of the points system used for Team BeyBattles in the WBO’s Team Format where Team BeyBattles are won and lost based on the amount of total round wins each team earns. 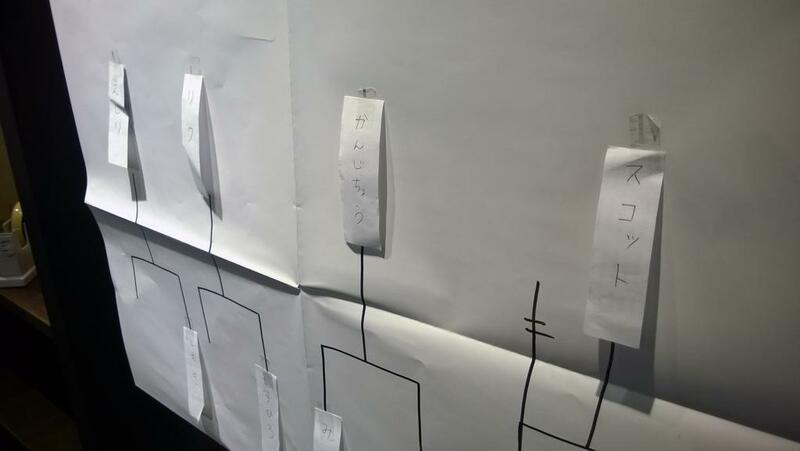 Most people have unfortunately not had the opportunity to experience the fun strategic depth of Team Format, so it would be fun if in the future the WBO could find a way to integrate a format similar to the one used for this tournament at Fujiya and similar to TAKARA-TOMY’s rules of 1 Point for Spin/Over Finish and 2 for Burst Finish (or maybe modify this so that Over Finish earns you 2 Points as well). One other thing I noticed at this event was how lenient calls for “shoot miss” were. 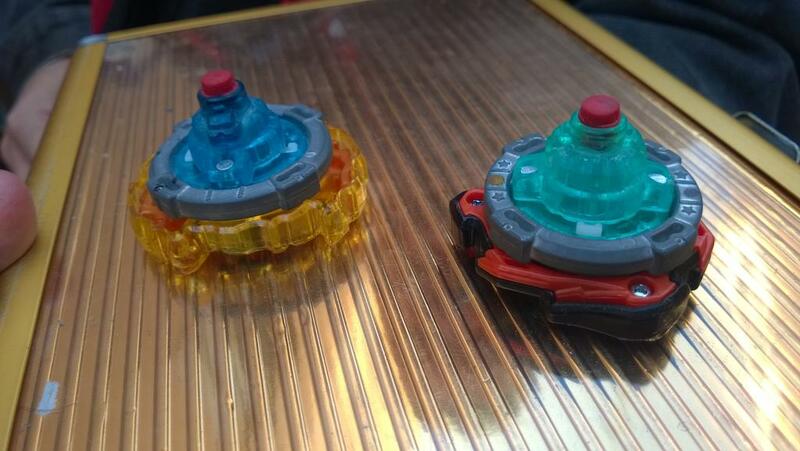 They seemed to be taking the phrase quite literally and eventually I figured out that if the two Beyblades did not collide at all before one “missed” or exited the stadium at the very beginning of the battle, the round was nullified and restarted. This felt overly forgiving because I believe players should be held responsible for shooting their Beyblades properly into the stadium if their launcher is working properly, but I understand that maybe for kids it feels unfair to have lost by missing the stadium. My first opponent was using a good combo in Deathscyther Spread Claw and was an adult, but I got the impression that he wasn’t very experienced and he was also using a Light Launcher, so I went with Odin Heavy Defense and won quite easily 3-0. Aaahhh! All of a sudden ブレーダーMASA and I were thrust into a rematch of the prior day’s final! However this time I wasn’t feeling as gutsy, so I went with Odin Heavy Defense (or maybe it was Deathscyther … a little fuzzy on this) and managed to pull off the win 3-0. So far so good. 6 points earned, 0 given up. Then, as two of the undefeated players after the first two rounds of Swiss … keep・わりベイ and I were set to face off. After observing the first two rounds he was quite obviously the best Blader in the entire tournament, unsurprising given his WARI-BEY member status. Also unsurprising was his use of Deathscyther Heavy Defense. Having observed his first few battles I began mentally formulating my strategy because I figured inevitably we would play each other as long as I kept winning. I still was unsure of the whole Odin vs. Deathscyther situation, and his launch was fairly powerful, so it felt useless to play the mirror match game too. I decided to go for Valkyrie Heavy Accel because it felt like my best chance for victory, and I was 2-0 at this point, so I could afford a loss. Unfortuantely, things didn’t go so well for me this time as they had the previous day. I lost 4-0 (Spin Finish x2, Burst Finish x1), I believe. At least two of the rounds I landed several great blows on Deathscyther, but came up with nothing to show for it. keep・わりベイ was certainly surprised to see me use Valkyrie, that’s for sure, and told me afterwards that it was a good battle. That 4-0 loss and I think one other lucky 4-point win for keep・わりベイ in the fourth round helped to put him ahead of everyone else, earning himself 1st Place! By this point in the tournament I had enough time to observe all of the players and what they had been using quite thoroughly and knew that my opponent in this round would probably use a Spriggan Accel combo. This time instead of using Wyvern Heavy Claw, I felt a little safer using Odin Spread Blow to evade his attacks rather than take them. My launch was stronger than his, and with Blow’s different pace of movement, it was able to avoid Spriggan quite effectively. I believe I won this battle 3-1.
keep・わりベイ seemed quite impressed by this battle. I suppose this was because of how relatively unusual Odin Spread Blow is, but he also mentioned to me afterwards how impressive and different my shooting technique was. At this point I started to think about how the experience of standing up to shoot in Japan is quite different than at our Toronto WBO events where the stadium is always on the ground and everyone sits or kneels down to shoot. Maybe you have noticed after watching the above videos, but in Japan I think I naturally developed a technique that’s a little different than how I used to shoot as a result of getting so accustomed to standing. After Swiss was complete, there was a tie for 2nd/3rd … that 4-0 loss against keep・わりベイ had come back to bite me; just a single point against him and I would have clearly secured 2nd. In any case, here I was. My opponent surprisingly chose a Kerbeus Accel combo … so Odin Heavy Defense is a sure-bet, right? Well, he ended up earning not one, but two Burst Finishes against me! Thankfully, one of them occurred simultaneously according to the judge (I think it may have actually been in his favour … but I wasn’t sure haha), so I was able to continue on and earn a 3-2 victory, securing 2nd Place and a red wbba. Spread Disk! After the event keep・わりベイ asked if we could take a picture together, and then sent it to another WARI-BEY member (I think?) on LINE. Really cool guy! I just wish my Japanese was more fluent so I could properly communicate with him. 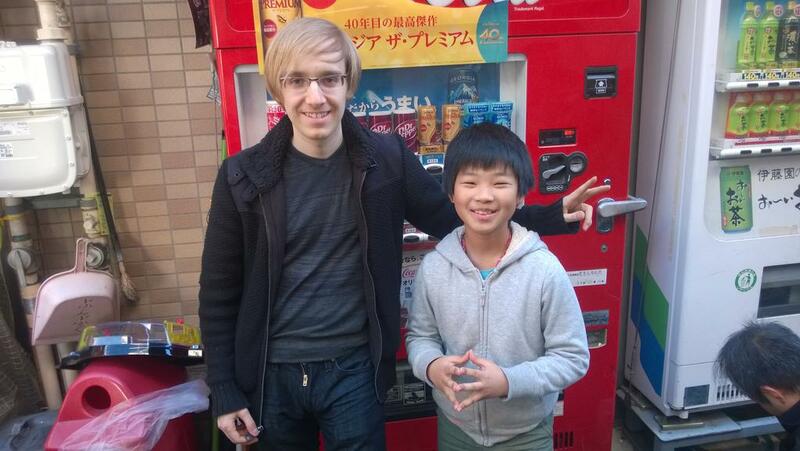 It was a great end to my two weeks in Japan. At one of the events I attended, WARI-BEY members spoke about how we should refrain from posting details of upcoming releases found from shop catalogues. According to them, these catalogues are intended to remain private for the use of the shop in planning what sort of inventory to purchase. This I think I already knew, but what I did not know is that whenever TAKARA-TOMY sees that there has been a leak, there is a chance that next time they will send not only the infringing store only a list of upcoming release names–but with no additional information or photos–but all stores in the area (or something to this effect), which in turn hurts the hobby shops that support the game. 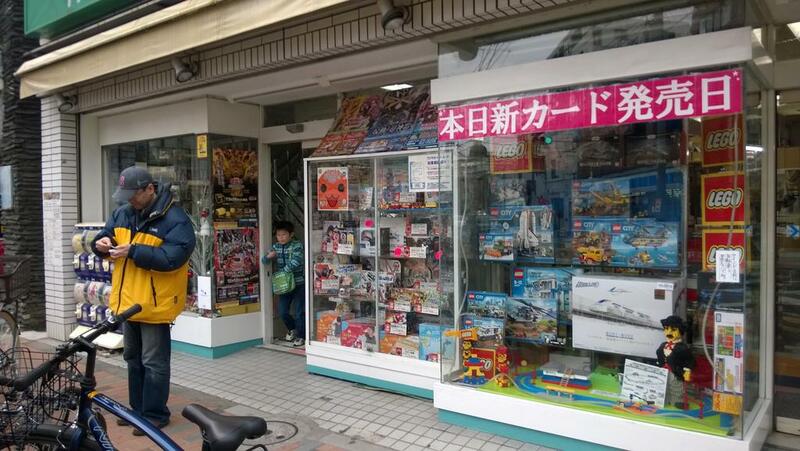 Another issue they raised was that in Japan many parents restrict their children’s access to the internet, and as a result the only opportunity they really have to see new releases is in Coro Coro, and that is how TAKARA-TOMY intends new information to be released to the public. WARI-BEY members do share information amongst themselves, but it isn’t something they make widely available on the internet. And in my experience, I guess some shop owners also show tournament players the catalogue as well after events … obviously however, you’re not allowed to take photos because it isn’t meant to be distributed. Jumbo spoke about how the original world championship in 2004 was slightly unfair to at least Japan because of the differing rules globally regarding the age of participants. In Japan, players as old as 15 were not allowed to participate, and as a result, their representative was younger. However, the eventual champion from the USA–Noland–was 15. After the third event I attended, Jumbo and RICK gave me the wbba. black Spriggan and red Spread Disks that they had won! I had just won the black Fusion Driver and they knew I didn’t have the complete set, so they gave them to me. They’ve won so many so it wasn’t a huge deal for them, but I was really touched! Jumbo didn't have the power to make me a full member, but without me even asking him, he said at one point that I was "almost" a member of WARI-BEY. Honorary member, I guess! Looking back on the five tournaments I attended in both Osaka and Tokyo, and all of the people I met, the feelings that I think characterize and capture my experience the best are those of kindness in the midst of honest competition, and happiness in spite of any barriers between us. 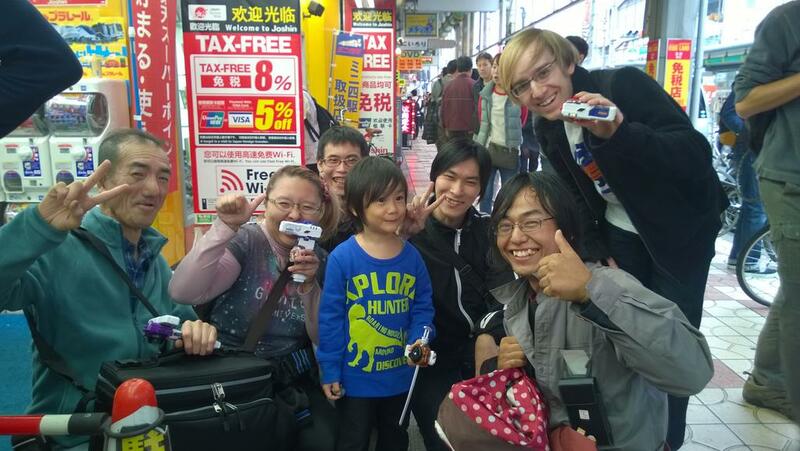 Even though I was often frustrated by my relatively poor Japanese fluency–and only feel more motivated to improve that now–I still felt as if I was able to create new friends as a result of our love for the game. 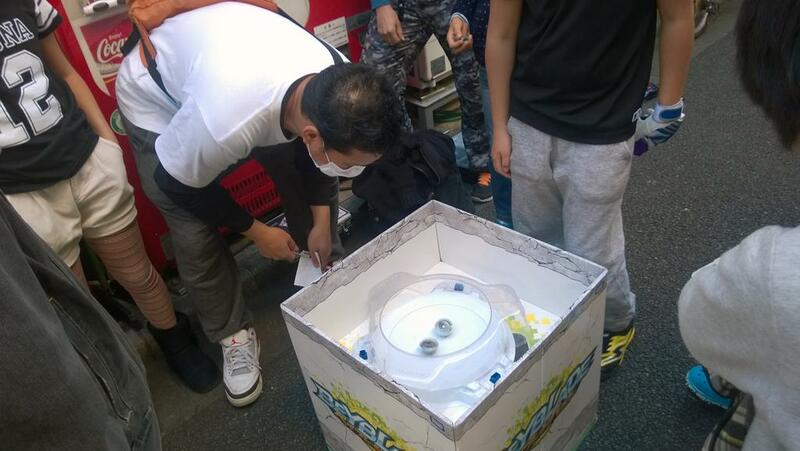 As I mentioned briefly near the beginning of this report, in many ways, the Japanese Beyblade community felt similar to the WBO community, or at least the environment found at events here in Toronto. Everybody was always positive, respectful, and having a good time together, while still playing seriously. It was a perfect balance; the type of balance I think every community should strive to achieve. 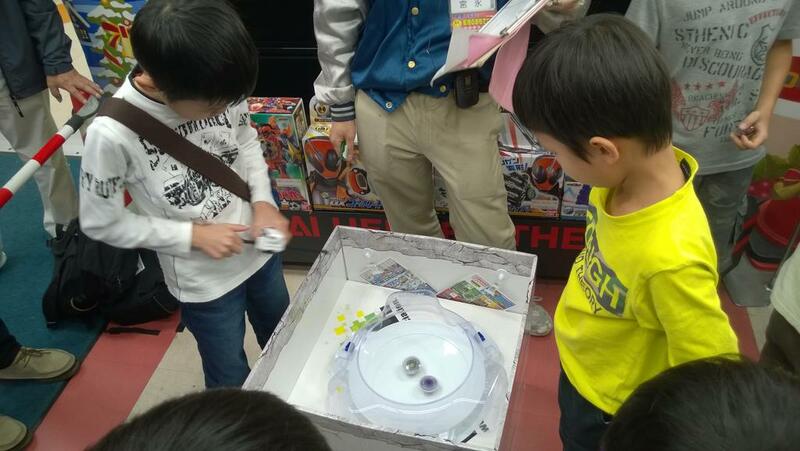 Given that Japan is a relatively small country, I think they will always have some advantage over many of the other countries where Beyblade is popular; this size, the volume of hobby shops, and volume of official tournaments in places like Tokyo probably makes it relatively easy for a community to form quite organically through official channels. In other places like Canada or the USA that are much larger and do not have nearly as many official tournaments when the series is active, it would be difficult for such a community to form without the existence of the WBO. 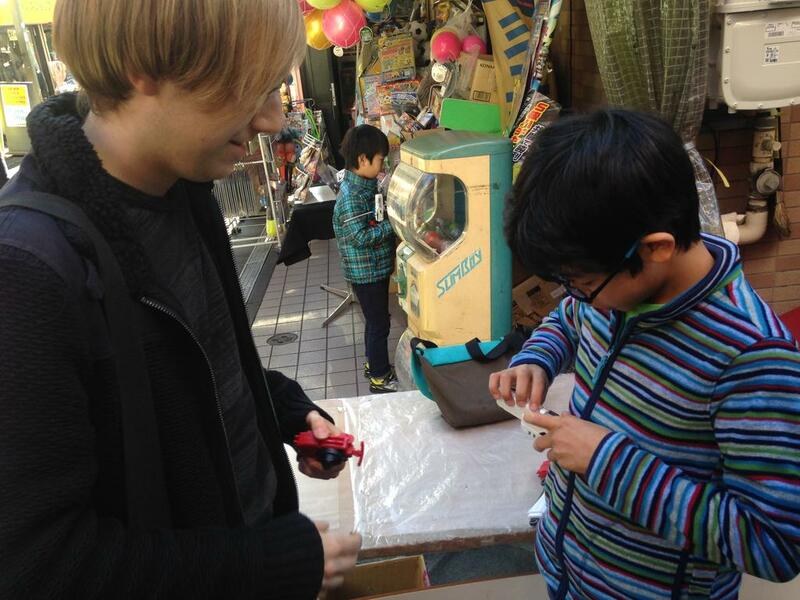 So in the end, visiting Japan has reinforced for me how vital what we’re doing here on the WBO is. But perceiving these similarities between both of our communities encouraged me to reach out to WARI-BEY about the possibility of hosting a WBO x WARI-BEY tournament next year in Japan. I had already been planning to return in late March/April, and they were open to the idea, so I hope to soon put this idea into action to see if we can make something happen! Please look forward to hopefully hearing about that in "Part 2" of this report next year. 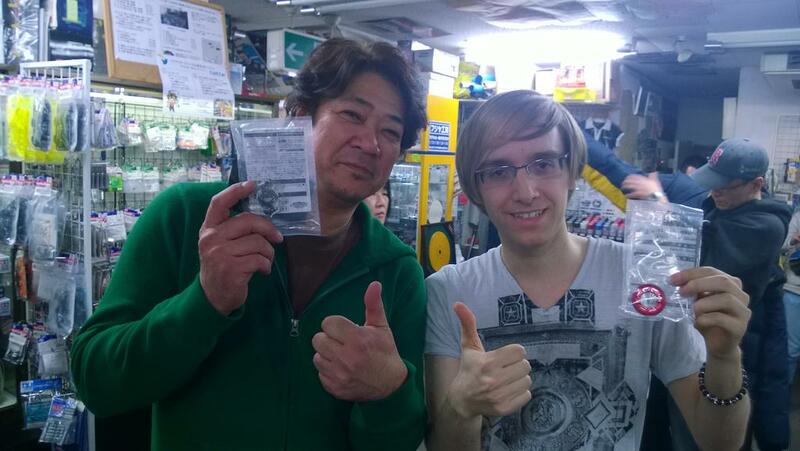 Hey, really glad to hear you had a good experience in Japan! Welcome back! Deathscyther Heavy Defense may be something to look into. Odin has easily better defense and less recoil, but it did seem to lose against it quite consistently from your video against MIYU. Seems like it might be good just for beating OHD (but also running the risk of losing against what it seems like a ton of other things). Congrats on winning the Amaterios', as well! You definitely deserve them! Wow, very cool experience! Thanks for sharing it with all of us! 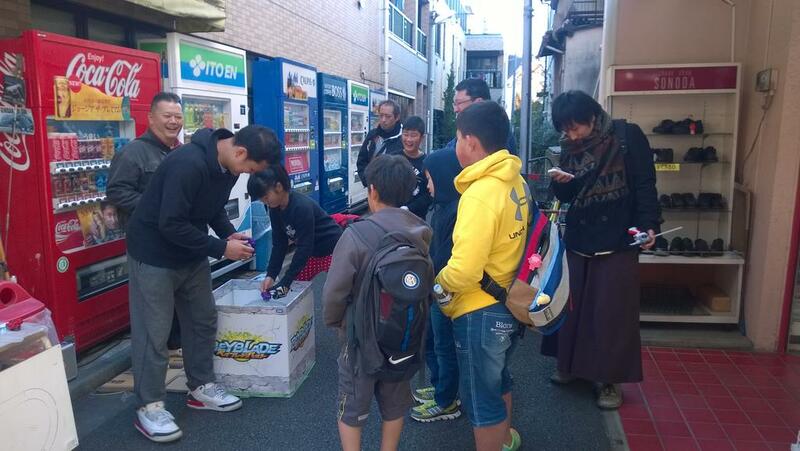 It's always interesting to hear from the Japanese Beyblade Community since we don't have many active WBO members down there compared to other regions. Man, this is awesome. Living the dream. Congratulations! The Japan tournaments are interesting with all the different rulings! It's interesting how it varies. OHD seems like a beast, and then DHD comes along and destroys it... Very interesting, let's see how it plays out at the next Toronto tournament! Man, props to you for bringing and wearing our T-shirt, especially right before that logo became extinct hah. The variety of tournament formats definitely surprises me, notably the win streak one. Since we use Attack types a lot more than in Japan though, I doubt we would ever implement the rule where a Burst Finish is worth two points. 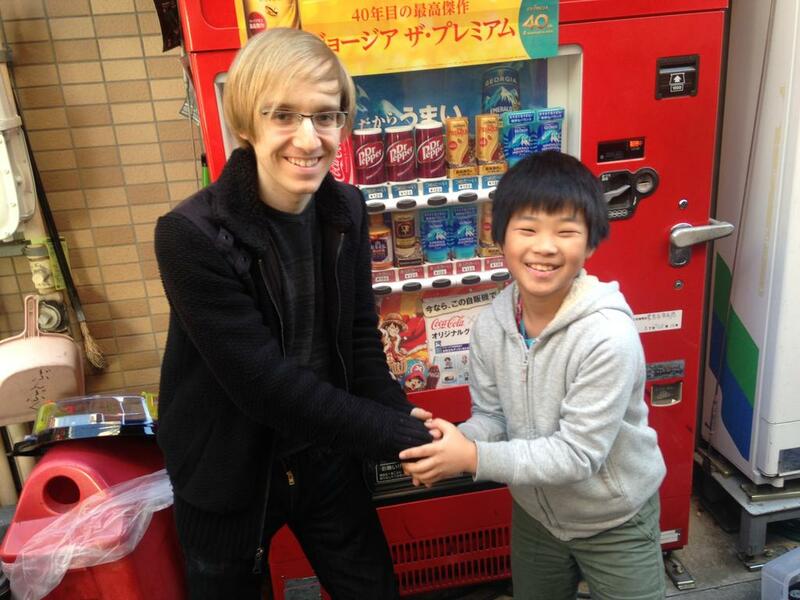 I also do not believe that the only reason there is a distance between the Japanese community and the World Beyblade Organization is the language barrier, from my own experiences trying to reach out to them, but I am definitely glad that they bonded with you when you were there, at least. Great post. Wish I could have come with you man! Also, most importantly: how do I become a Tokyo Handsome Boy?!?! Great report Kei, really in-depth and interesting. Glad to see you and everyone else at those tournaments had so much fun. 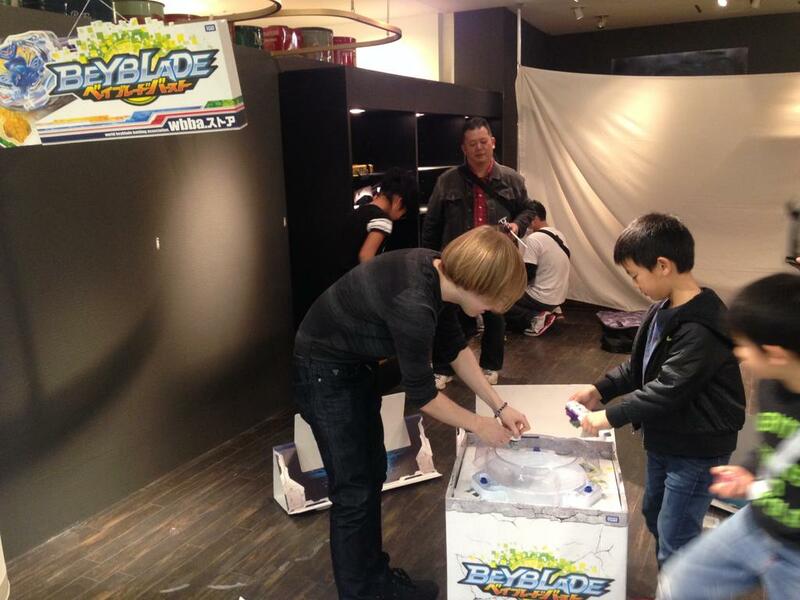 On a side note, this kind of reminded me of those services where you tour a foreign country to play at different golf courses, except this time, it was to play Beyblade at different stores, haha. Dude, watching the reaction to your Amaterios win was absolutely amazing. Such awesome vibes haha. Clearly this was a lot of fun for you, so congrats! I can't wait for Part 2. I visited Japan on exchange when I was young. My memories of the experience all revolve around one unifying thing: utterly overwhelming confusion! Everything was so massive, condesnsed and yet fluid and constantly changing. The people there were all so nice that I made it through and enjoyed the experience - but to organise a trip there the way you have is a real achievement to be proud of. 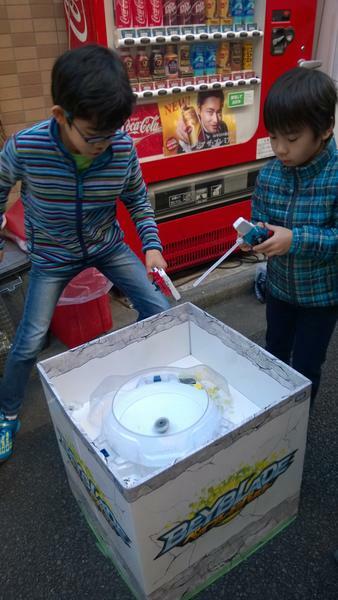 I sense the beginnings of Beyblade adventure-tourism! 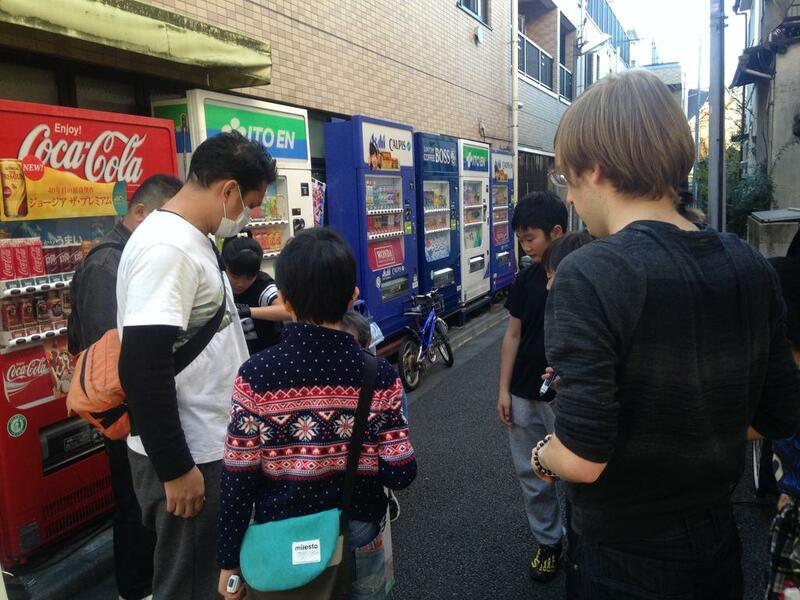 (Dec. 12, 2015 1:52 PM)Mitsu Wrote: Hey, really glad to hear you had a good experience in Japan! Welcome back! And yeah, for sure. I think obviously, the match-up is quite close ... maybe the biggest deciding factor is the launch strength of each player. (Dec. 12, 2015 2:36 PM)Leone19 Wrote: Wow, very cool experience! Thanks for sharing it with all of us! Yeah! Traveling to Japan by myself is one of the best decisions I've ever made, I think. Exactly. The whole community over there is largely unknown to most of us, so it was really special to be able to experience it first hand and connect with them. (Dec. 12, 2015 4:06 PM)ashton pinto Wrote: Thanks for sharing ! (Dec. 12, 2015 4:30 PM)xVaretyr Wrote: Man, this is awesome. Living the dream. Congratulations! Thank you! I hope other people can be inspired to live this dream too after reading about my experience. It took between 11-13 hours to get there, and those were on direct flights! 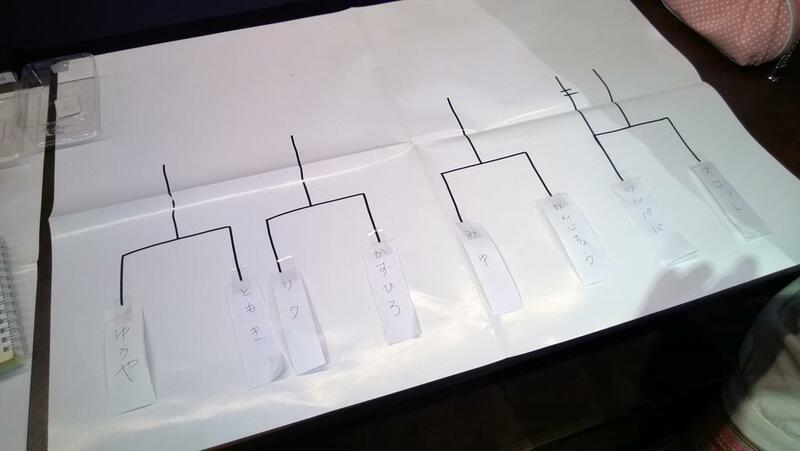 (Dec. 12, 2015 5:22 PM)Hato Wrote: The Japan tournaments are interesting with all the different rulings! It's interesting how it varies. Yeah, I was surprised. I guess TAKARA-TOMY must allow for that at G4 events so they can be as accommodating as possible to the amount of time each shop can dedicate to their events (for example, most shops probably don't have the time to dedicate an employee for an entire hour or two to do a Swiss Format event like Fujiya did); I'm sure that at G3, 2, and 1 events the format would be more standardized. That sounds like a great trip to me too lol. Do it! (Dec. 12, 2015 5:53 PM)Kai-V Wrote: Man, props to you for bringing and wearing our T-shirt, especially right before that logo became extinct hah. Haha, Brad had suggested I wear a pre-release version of our new t-shirts since I could have received one in time ... but I decided not to because I wasn't sure if people would post pictures of me online before we got a chance to reveal the logo. Yeah, like I mentioned above I think that for G4 events the rules are probably a little bit more loose so that they can be more accommodating to how much time shops can dedicated to events. And I'm not necessarily trying to be a huge proponent of the 2 Point Burst Finish rule, but why not? So if we are hypothesizing that it would occur more often because we use Attack types more, is that really a bad thing? You have to think about what he response would be to an increased incentive to using Attack types: more Defense types, and subsequently, people trying to counter that with Stamina types sometimes. In the end, I think it might make the game even more exciting and possibly even more strategic. Would be fun if we could test out the format somewhere sometime to see how it goes. What have your experiences been like? I can't recall. My experience was certainly quite positive and they were receptive to the idea of doing a WBO event in Tokyo, so I wonder what sort of issues you can into in the past. (Dec. 12, 2015 6:03 PM)One-Launch Man Wrote: Great post. Wish I could have come with you man! 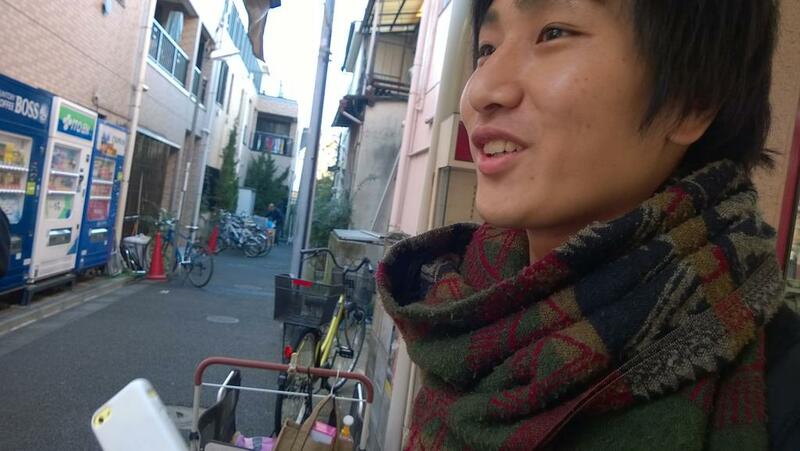 Yuuya told me: "As long as he/she is handsome,everyone is eligible to be a Tokyo handsome boys!yeah!!" 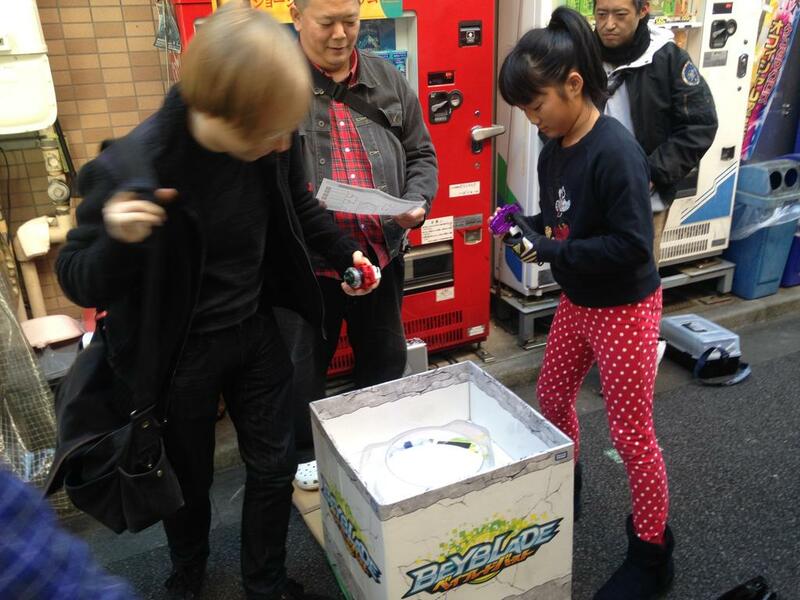 (Dec. 12, 2015 7:06 PM)Half Nail Wrote: On a side note, this kind of reminded me of those services where you tour a foreign country to play at different golf courses, except this time, it was to play Beyblade at different stores, haha. Haha, pretty much. While I was there I kept thinking about how much fun it would be to just go to events every weekend. 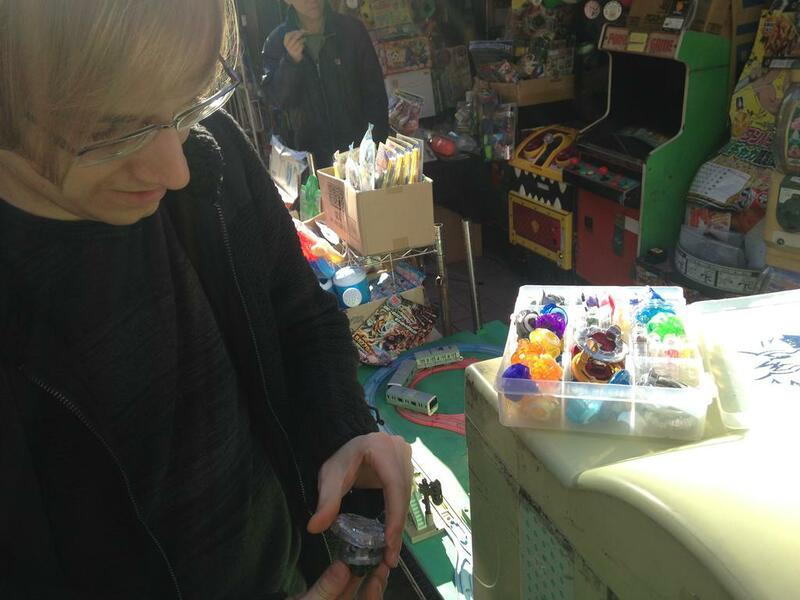 The best day was when we went to BE☆POP and then Bunbuku Toys back-to-back. Even at the "experience" events where no physical prizes were available, I could still feel the incentive to go only for the chance to earn BP on my account. Despite any problems with the design of the BeyLogger itself, I think what TAKARA-TOMY has done with it and the whole rankings system brilliantly encourages people to play as often as they can. And TAKARA-TOMY makes it easy to do with events constantly being hosted every week. And even though part of me was disappointed with the short length of most of the events, I also appreciate how because of their short length they didn't feel like huge investments if you ended up losing. They were just fun, short, but competitive meet-ups for the Bladers that attended. And that might be enough to keep people interested if they can go to a lot of them every week. For G4 events, I think this is perfectly fine. (Dec. 12, 2015 7:17 PM)*Ginga* Wrote: Dude, watching the reaction to your Amaterios win was absolutely amazing. Such awesome vibes haha. Haha, that was maybe one of the best moments on my entire trip! Couldn't believe it. (Dec. 12, 2015 8:40 PM)Beylon Wrote: Living. The. Dream. Thank you so much! Your description sounds quite similar to what I experienced in Japan. When I came back to Canada I was struck by how much space we really have here. Kei Wrote: Yuuya told me: "As long as he/she is handsome,everyone is eligible to be a Tokyo handsome boys!yeah!!" Please tell them that Hato is joining. But back on topic: do you think there will ever be a WBO tournament in Japan, Kei? As you said, they seem pretty positive to the idea. I hope there can be some, as it would me a good expansion for the WBO and along with the fact that they seem open to the idea. 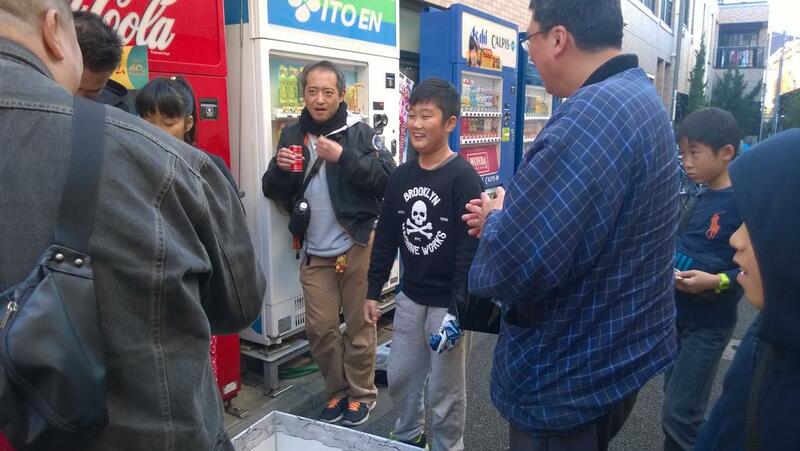 (Dec. 13, 2015 12:59 AM)Hato Wrote: But back on topic: do you think there will ever be a WBO tournament in Japan, @[Kei]? As you said, they seem pretty positive to the idea. I hope there can be some, as it would me a good expansion for the WBO and along with the fact that they seem open to the idea. This would be awesome. 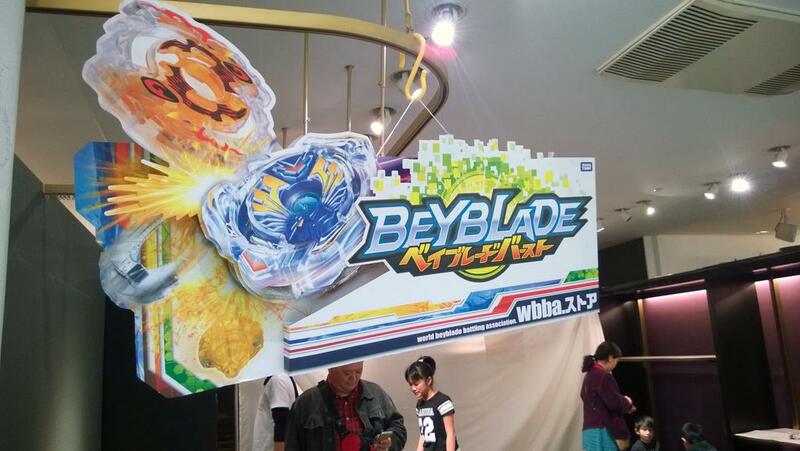 Having the WBO expand to the homeland of Beyblade! I'm returning next March/April as I mentioned, so the plan is to hopefully host one then as a start. (Dec. 13, 2015 12:42 AM)Kei Wrote: Haha, Brad had suggested I wear a pre-release version of our new t-shirts since I could have received one in time ... but I decided not to because I wasn't sure if people would post pictures of me online before we got a chance to reveal the logo. We could certainly try it out, but I also do not know if more than the regular Attacker Bladers would end up using Attack types. Oh, I was basically told to "carp off", notably. However, if I remember correctly that remark was from a HD Academy member, not Wari-Bey. It would have been interesting for you to bump into one of those hah. Wow this was like reading a story book! Very interesting and enjoyable! I hope I am fortunate enough to eventually take this trip myself. 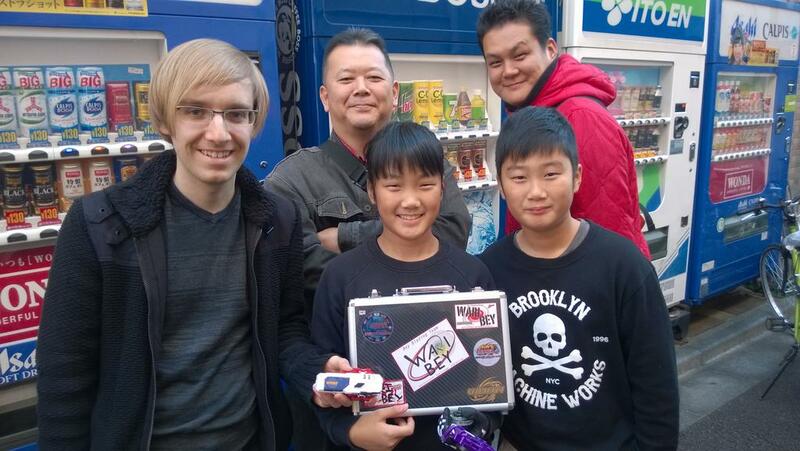 Thank you for putting so much time and effort into the Beyblade community as well as sharing the experience with all. 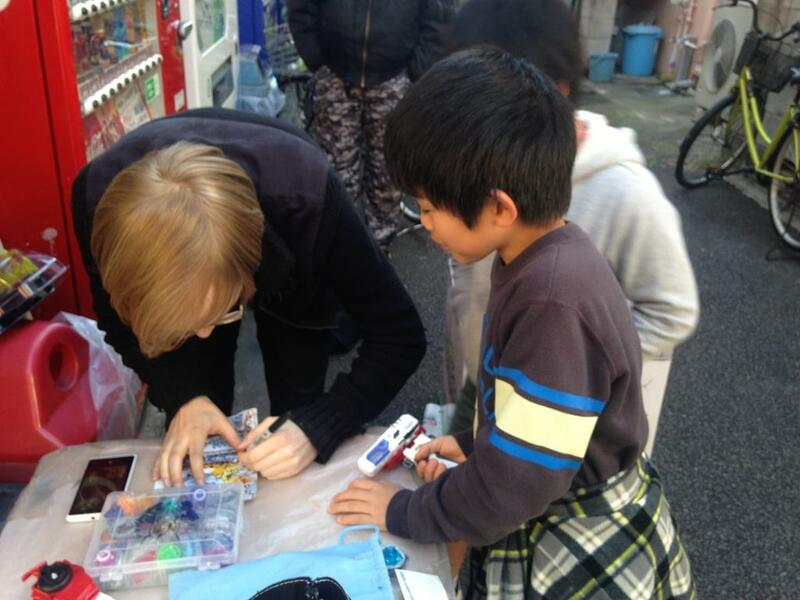 This will hopefully make the World Beyblade Organization a much bigger community internationally. Hope you had a great time! Awesome stuff, Kei! Thanks so much for taking the time to write this all up – was a really fascinating and enjoyable read. It's amazing that WARI BEY is interested in running a tournament with us! I remember seeing them on the internet all the time when I was much younger, so it's so cool to see that they're still around. With regards to how the Japanese community will accept us or not ... obviously, there are huge differences in how we see things vs. how large parts of the Japanese community might (for example, posting leaked information). At the same time, the Japanese community is not a monolith any more than ours is; I don't think any individual situation should be taken as representative of the entire community, on either side. Love your video vs Masa. So intense. Hope I can somehow go with you next time. This was an awesome read, it looks like you had a lot of fun. If you don't mind me asking, how did you even find the information for any of this before you went? Haha. Originally I was going to go for a vacation, but my plans ended up changing towards the latter half of this year and I'll be going to Tokyo for two years to attend a language school (Everything has already been set in motion, just need to fill out my visa application, which isn't until March) starting in July. I definitely need to track down わりベイ once I arrive. I found Jumbo on Twitter pretty easily, I guess I'll try hitting him up when I land get there lol. Do you know which wards of Tokyo the different events happened in? You didn't really mention that part, all you said was Tokyo. I'll be residing in Shinjuku while I'm there. Wow, this is incredible! 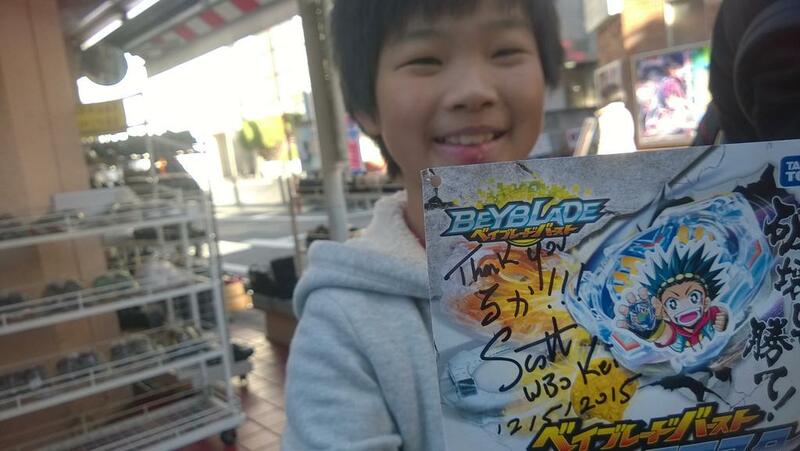 So glad that your experience with the Beyblade community in Japan was such a positive one, Kei. 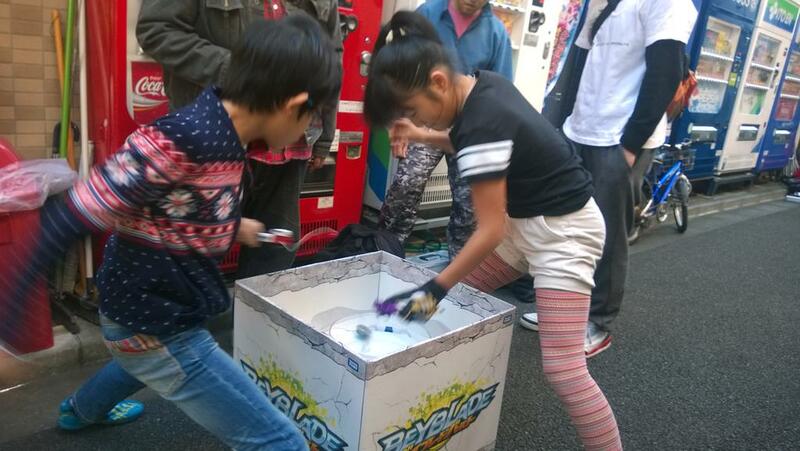 I'm surprised that some of the tournaments there were as small as ours, but it gives me hope that Beyblade isn't quite as dead over here as I presumed it to be. I plan to study in Japan in fall of 2017 and may do a summer abroad trip this coming year—hopefully I'll have the opportunity to connect with the Japanese Beyblade community like you. Here's to collaboration between the WBO and Wari-Bey in the future! (Dec. 13, 2015 5:30 PM)The Supreme One Wrote: Here's to collaboration between the WBO and Wari-Bey in the future! Oh man, I feel bad for Wari-Bey now. First this Canadian guy hunts them down to study the ancient art of Beyblade like something out of a retro kung-fu movie, then he leaves and over time they keep getting visited and challenged by his other foreign minion sent to defeat his old masters. Kei Can I have the rights to your story so I can make it a movie?